Every Wednesday, I’ll be sharing one of my favorite photos from my travels. Amidst the busy markets and bustling streets of Hoi An, tourists can find themselves touring the rice farms and meeting the farmers who provide kilos upon kilos of rice for the local families. 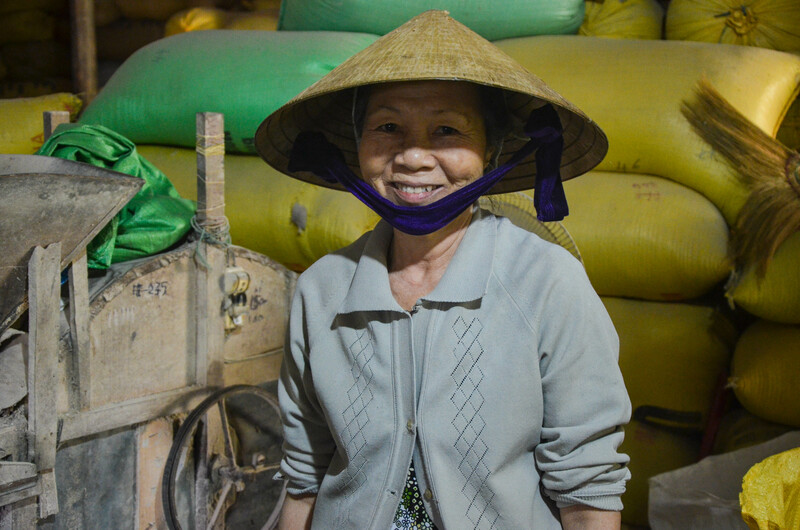 This is Mama, the proprietor of her family’s rice business. She was kind enough to give us a full demonstration of the rice farming process which she continues for up to twelve hours at a time. While I watched her sort and grind the husks, several families visited to drop off their own bags of unprocessed rice, 5 kilos of which could feed a family for a week. Thanks to my dear friend Erin over at Quarter Life Wanderings, I’ve been nominated for the Liebster Award. Thanks Erin, it’s greatly appreciated! You should definitely check out her site when you get a chance, her stories and photos are amazing! So what exactly is the Liebster Award? The Liebster Award is an opportunity for bloggers with less than 200 followers to get discovered and promote other bloggers in the blogosphere. While not an award in the literal sense, the Liebster is a great way for up and coming bloggers to interact and promote each other while meeting like minded people online. I personally find idea to be genius! 1. What was the first place you visited and why? After graduating university, I decided to treat myself to a holiday outside of the States. Like most graduates, I was pretty strapped for cash so my options were quite limited. Thankfully, Mexicana Airlines was still operational at the time and I scored myself a cheap ticket to Costa Rica. It was my first major trip aboard and I thoroughly enjoyed every minute of it. From learning how to surf to hiking an active volcano, I was living la pura vida and didn’t ever want to leave. If you’re a reader of my blog, you’re probably quite aware that I’m a big fan of the Philippines. I love it so much that I have visited the country on four separate occasions. The Palawan region is a place that is particularly untouched and dear to me. Unfortunately, there is one place in the Philippines that I won’t ever return to and it’s called Puerto Galera. Just the name of it alone brings a plethora of emotions, all of which are negative. I won’t get into too many details, but let’s just say my friends and I had our belongings stolen, were overcharged, and pretty much lost our dignity for reasons that probably shouldn’t be shared. It was one island I couldn’t wait to leave. My current dream destination is Nepal. I hope to explore it sometime soon especially after the devastating earthquakes to help give back. I’m a big fan of the outdoors and Buddhist culture and I think Nepal will offer the perfect mix of my two favorite things. From Annapurna Circuit to the Everest Base Camp hike, I hope to fully explore and enjoy Nepal’s grand landscape. This is a tough one as there so many places that come to mind, but if I had to just choose one I’d probably pick Costa Rica. It offers a bit of everything that I enjoy the most, rainforests, beaches, volcanoes, wildlife, good food and a laid back atmosphere. Not to mention, Costa Rica is an environmentally friendly country with more than 25% of its land either a National Park or a protected area. Before coming to Hong Kong, I lived in South Korea for a year where I spent the weekends exploring as much of the country as I could. Living in Korea made me realize that it is easily one of the most underrated countries in East Asia. While I try to immerse myself in the local culture as much as I can, I’m not that adventurous when it comes to outrageous eats. I’ve passed on opportunities to eat scorpion, silk worms, and fried bugs in the past, but I have tried chicken feet. While it’s not that extreme, that’s about the weirdest thing I have eaten so far. So far I have traveled to a total of 17 countries, most of which lie in Asia. Here’s the list in order of when I visited them, Poland, Mexico, Costa Rica, Panama, South Korea, China, Singapore, Malaysia, Thailand, Japan, Hong Kong, Macua, Philippines, Indonesia, Vietnam, United Arab Emirates, and Myanmar. 9. Name your three top destinations you’ve been to. Another tough one, but I’d have to say my top destinations (in no particular order) are Indonesia, Philippines, and Vietnam. I found Indonesia to be quite magical, from the rice fields of Bali to the temples of Borobudur, there is something unique in the air that is hard to describe. I think the Philippines is easily one of the most beautiful and friendliest countries I have visited. The Palawan region is so stunning and untouched, it’s one of the few remaining unspoiled tropical paradises left on Earth. Finally, Vietnam was the most surprising destination I visited. It’s super cheap, the people are gracious, the food is amazing, and the landscapes are unique. I often travel light, but the first thing I can’t ever travel without is my Nikon D7000. While it usually takes up the most room in my bag, it’s often the first thing I think of and the one item I use the most. And of course, I never travel without my pad and pen, Kindle, passport, and wallet! 11. Is there a place you would never go back to and why? I’m a big believer in second chances. While I wasn’t a very big fan of Singapore, I hope to return sometime soon and give it a second chance. However, as explained earlier, Puerto Galera is one place that I definitely won’t go back to. 1.What was the hardest adjustment you had to make while traveling or living aboard? 2. What was one of your best moments traveling or living aboard? 3. Has anything gone wrong while traveling that seems funny now? 4. What’s the best meal you’ve ever had traveling? 5. What’s the one thing you cannot travel without? 6. What artists or songs would you include on your ideal playlist for a trip? 7. When traveling do your prefer city life or being in nature? 9. If you could move anywhere in the world where would it be? 10. What’s your favorite city? 11. What is your favorite travel quote and why? Sorry if any of you have done this before, you don’t have to do it again! Make sure you comment the link to your answers in my blog so we can read it! The arrival of autumn in South Korea brings a plethora of joyful festivals to the ‘Land of the Morning Calm.’ From the Andong Mask Dance Festival to the Busan World Fireworks Festival, there is something unique for just about everyone. One festival that is definitely worth adding to your Korean itinerary during this time of year is the Jinju Namgang Lantern Festival. 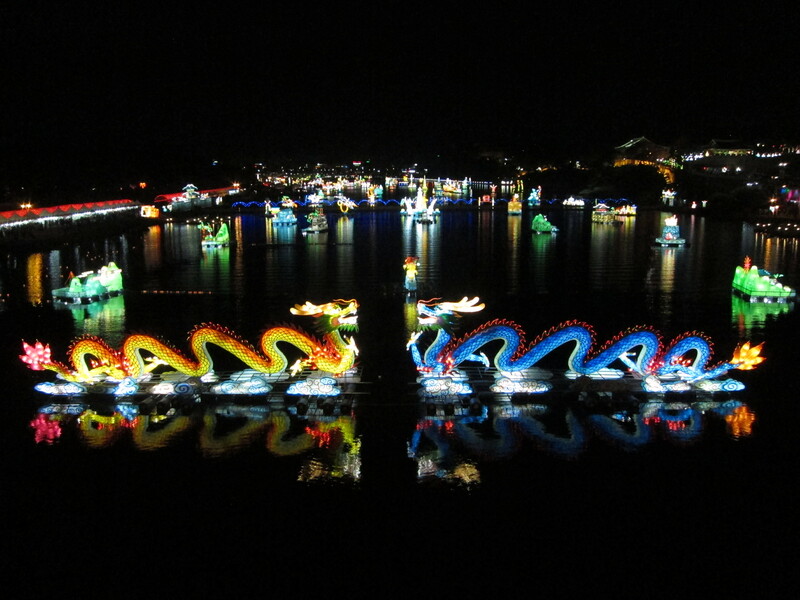 Home to more than 50,000 lanterns, the Jinju Namgang Lantern Festival is held each October over a two week period along the Namgang River in the southern city of Jinju. During this time, the city is transformed into an illuminated playground housing lanterns of every shape, size, and color. 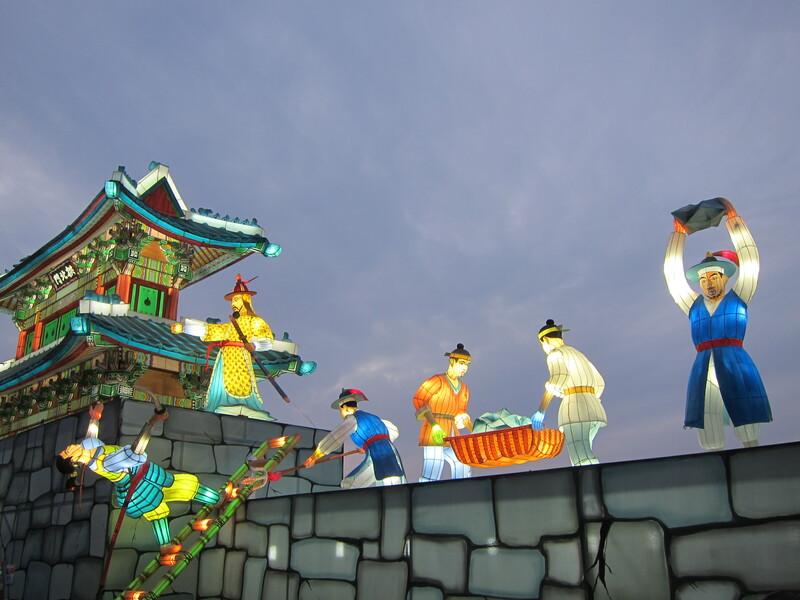 From modern day superhero shaped lanterns to more traditional representations of Korea’s historic past, the festival is a unique mix of old and new. 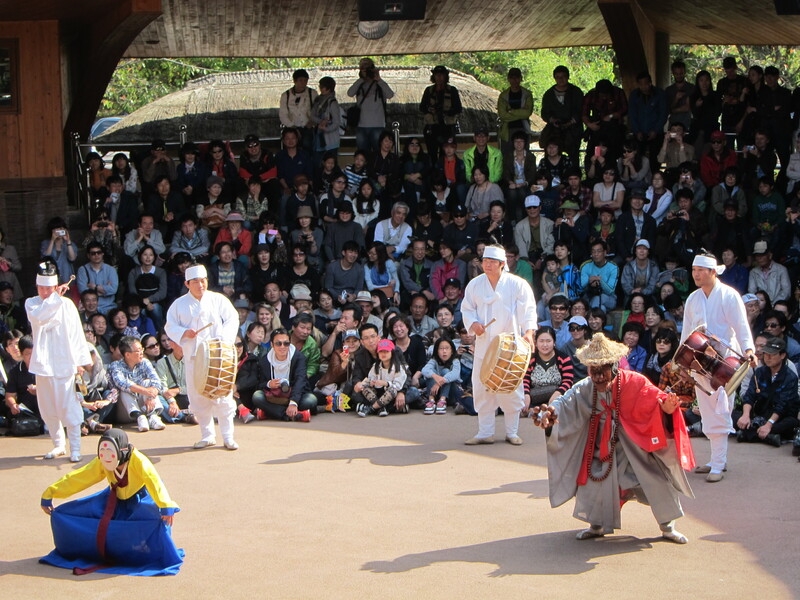 While it appears like a modern day event to most outsiders, the festival is steeped in history and originated during the Japanese invasion of Korea. It all began as a military strategy when Korean soldiers placed many lanterns on the Namgang River to prevent Japanese troops from wading across it. 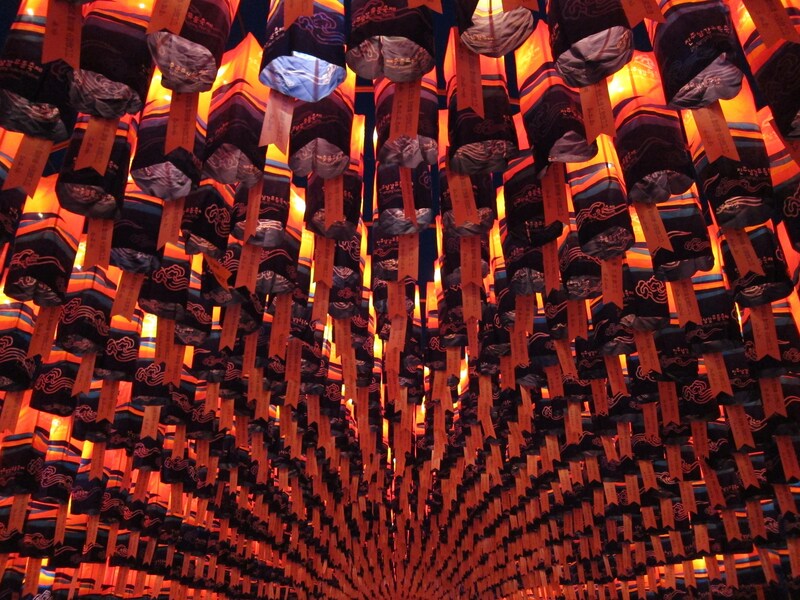 Their tactic proved to be successful and It has since become an annual tradition and one of the largest lantern festivals in Korea. 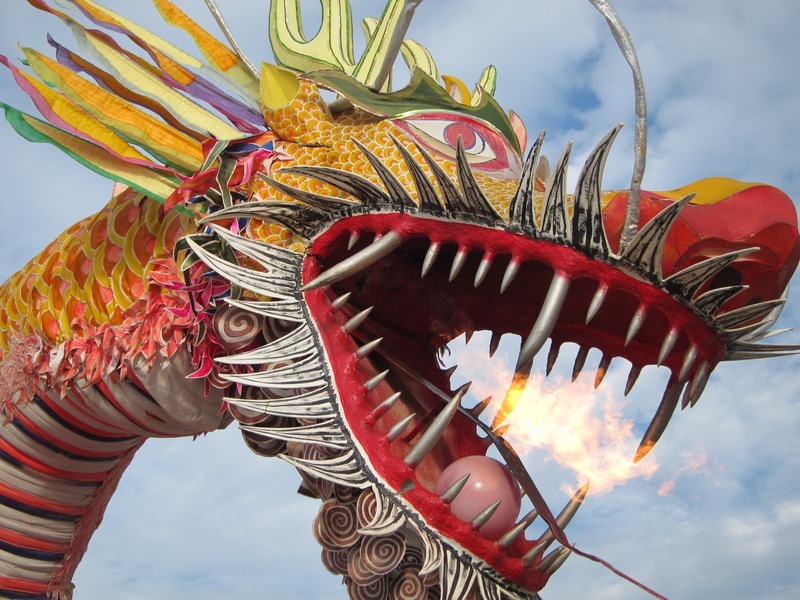 The highlights of the festival include wishing on lanterns, traditional lantern making, and a fireworks display over the river. It’s amazing how lanterns can be used in so many different ways. 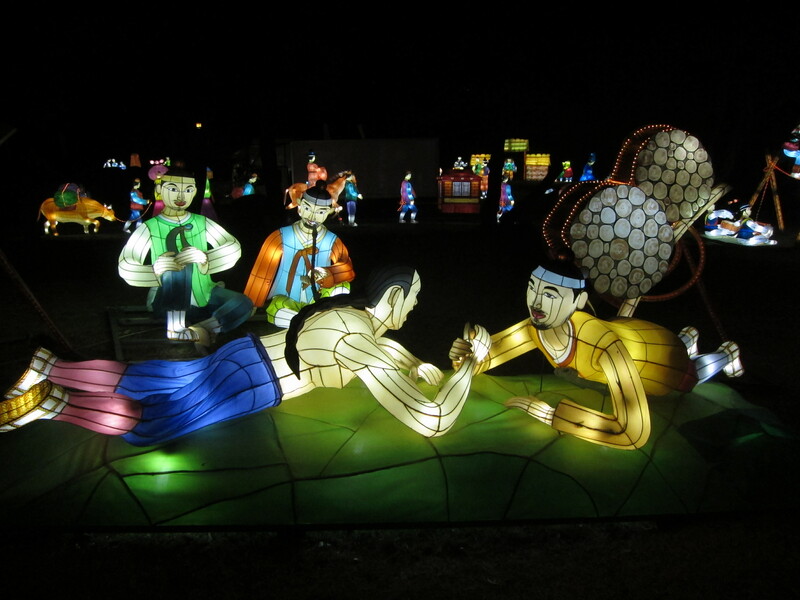 The Jinju Lantern Festival is the perfect place to spend an evening. From watching the colorful lanterns float down the river to wandering through the enchanted forest of lanterns that fill the city’s old fortress walls, it’s a beautiful experience. The festival’s surroundings create a peaceful atmosphere for all those who attend. Easily accessible by bus from both Busan and Daegu, the festival is certainly worth traveling to if you’re in the area. This year’s festivities will take place from October 1st to the 11th. 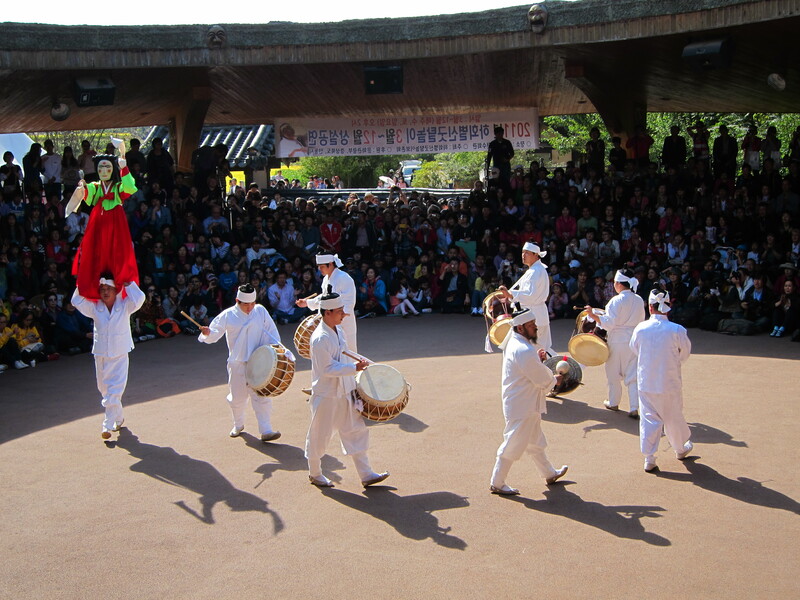 For more information check out the Jinju Namgang Yudeung Festival Website. 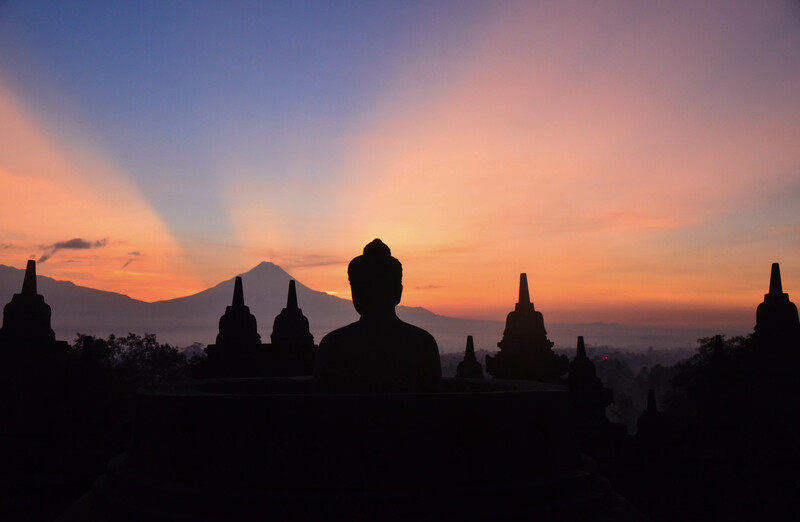 Located on Indonesia’s island of Java, Borobudur is home to the largest Buddhist temple in the world. Three-hundred years older than Angkor Wat, the temple was built between the 8th and 9th century and is positioned between twin active volcanoes which makes the view from the top even more impressive. With a total of 504 Buddha statues and various stupas built throughout the monument, the structure itself is the perfect frame. If you’re looking for a unique Korean experience, there’s no better place to start than the Andong Mask Dance Festival. Andong is home to the largest number of cultural artifacts in Korea which help paint a vivid picture of the peninsula’s storied past. Famous for its traditional folk village and annual Mask Dance Festival, Andong is an interesting place to explore Korea’s rich history. 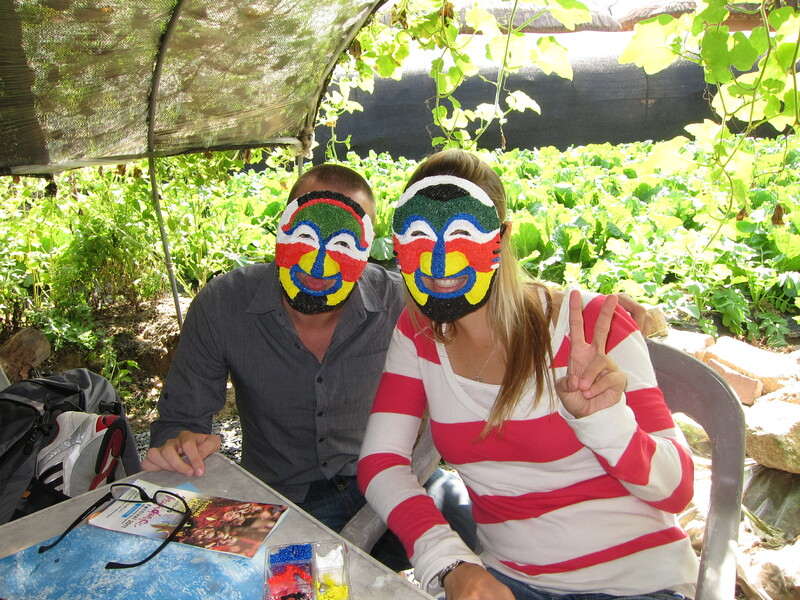 Masks have long played an integral part in Korean cultural, with natives believing they ward off evil spirits. 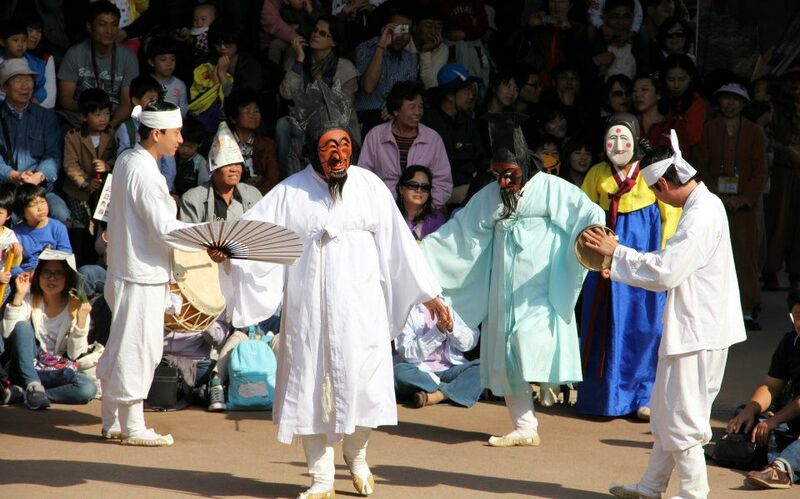 Once a year, Andong preserves this tradition by celebrating the historic masks through exhibition and folk dance. 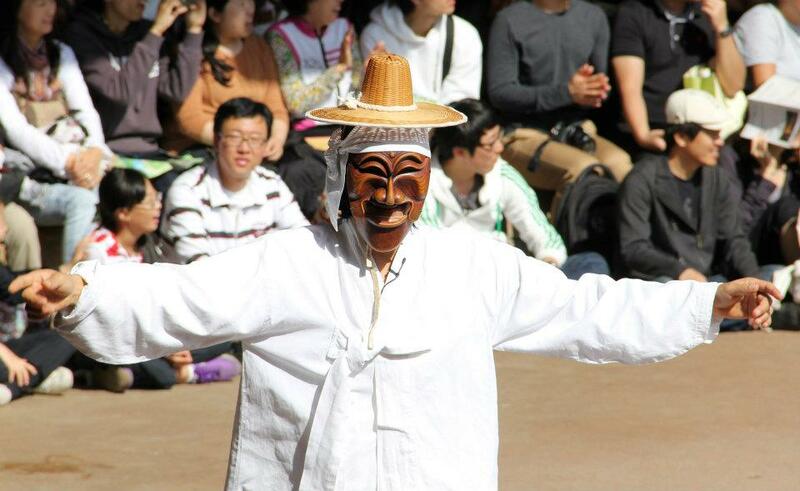 Visitors to the festival can enjoy various traditional mask dances, folk performances, and hands-on experiences, including conventional mask making and mask dance learning. Our visit to the festival began with an early morning bus ride to the festive grounds where various cultural activities could be experienced. We started off with mask making and chose traditional designs to decorate our twenty-first century cardboard cutouts. We felt almost childlike as we shaped our masks with floam (brightly-colored, sticky foam balls). While it was a bit too crafty for my taste, I have to admit it was enjoyable. We spent our afternoon exploring the Hahoe folk village, a beautiful place to wander as it is nestled in a lush valley between the Taebaek mountains. 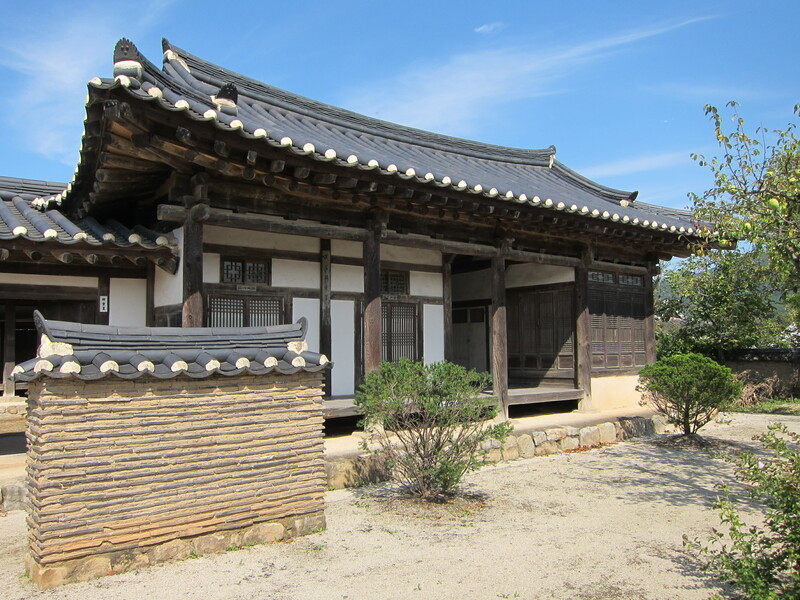 From here, various traditional dwellings can be explored. It’s easy to see why this quaint little village was recently designated a UNESCO World Heritage Site. After wandering around the village, the late afternoon was spent watching various traditional mask dances. The performances were an interesting sight to witness. The choreography mostly involved various men strutting and prancing around the stage. I personally found it quite comical, yet a bit baffling when a man dressed as a woman squatted mid-stage and “peed” and then one of the other characters proceeded to scoop it up and smell it. It was definitely lost in translation as the story was told in Korean which is a language I’m still not very familiar with. The festivities concluded with with a traditional fireworks display along the river, one of the most unique displays I have ever seen. It was more of a fireshow than a fireworks display as flaming bushes were thrown off the cliff’s edge into the river below and lit charcoals were strung across the river creating a rainstorm of sparkling embers. For those interested in checking out this year’s festivities, the Andong Mask Dance Festival will take place in late September, Friday 25th to Sunday, October 4th. If you’re in Korea during this time of the year, a jaunt to the festival is well worth the journey. For more information please visit the official Mask Dance Festival Website. Borneo is home to some of the rarest wildlife in the world. 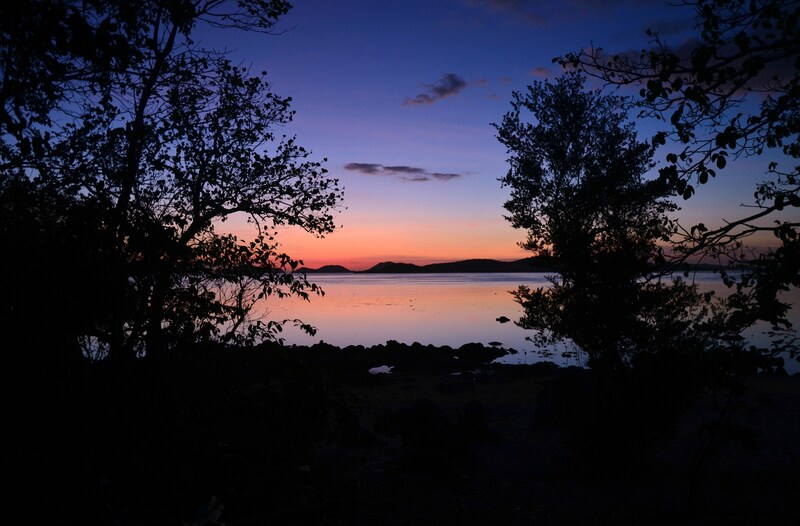 Various unique and endangered animals call this mystical island home. One of the best places to witness these rare animals in their natural habitat is along the Kinabatangan River in Malaysia. The river is one of the few remaining wildlife sanctuaries left in Borneo. I encountered all kinds of intriguing animals and distinctive plant life while exploring the area. Some of the most eccentric animals I came across were the proboscis monkeys. These strange looking creatures are often known for their long noses and unique reddish brown color. 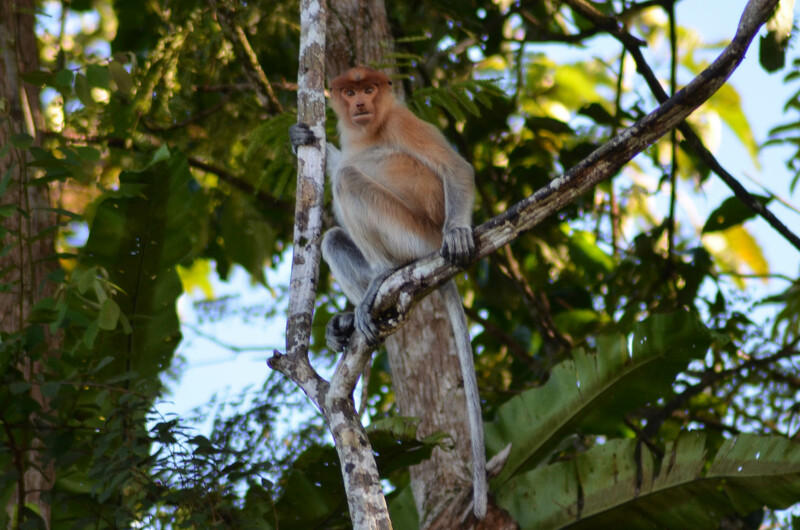 Here is a photo of a female proboscis monkey perched high up in a tree. Female proboscis monkeys have much shorter snots compared to their male counterparts, but they still look just as bizarre in their own unique way. The famous author Bill Bryson once said “The greatest reward and luxury of travel is to be able to experience everyday things as if for the first time.” Nowhere did I find this to be more true than the time I explored the Palawn Province of the Philippines. My trip to Palawan changed me in a way that’s difficult to describe. Nearly everything I encountered seemed to be out of this world, including the friendly locals and the magical sunsets. Simple everyday interactions and events were amplified by the untouched nature of the region and its genuine people. There was a magic in the air that is hard to define. 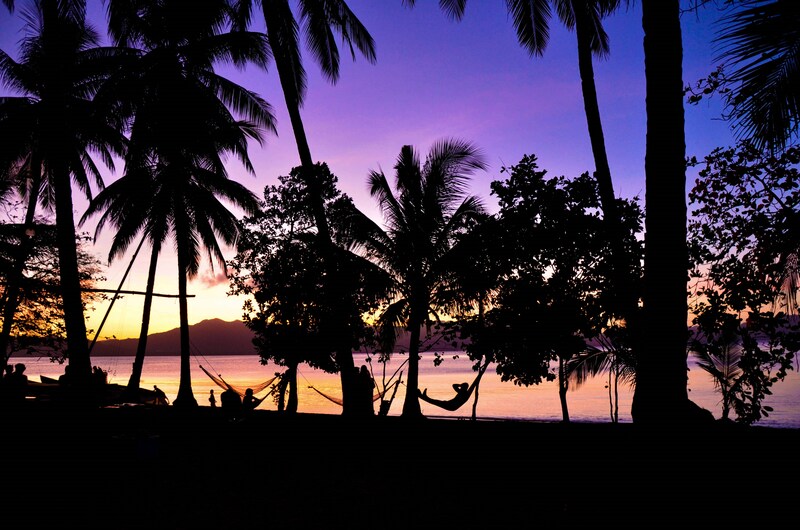 From pristine beaches to untouched coral reefs, Palawan is, for me, a timeless destination. It’s a place where everyday things truly are experienced. 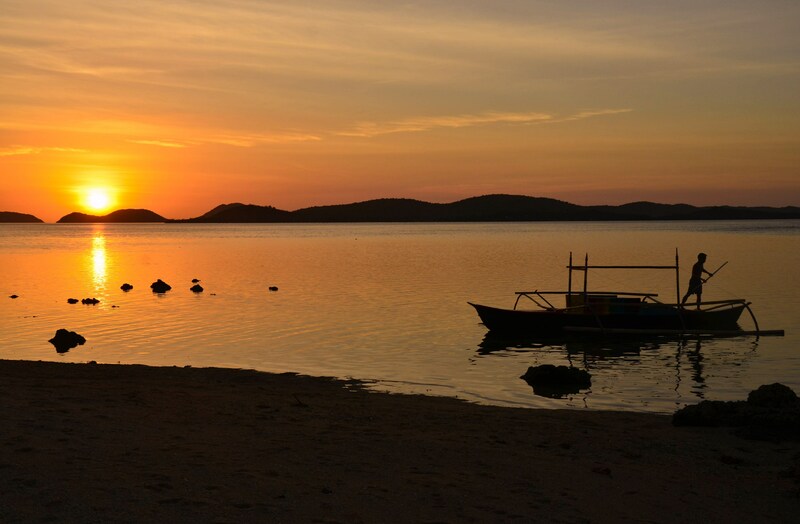 Something as simple as a sunset in Palawan can bring a wealth of emotion and imagination and bring to life the earlier quote. 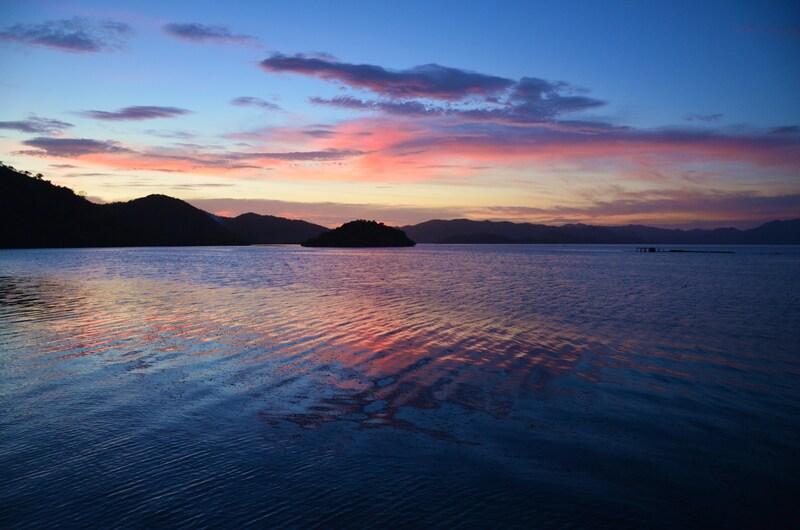 The stunning sunsets alone are well worth the flight to Palawan. Each day at dusk, the skies are transformed into magnificent canvases of color. 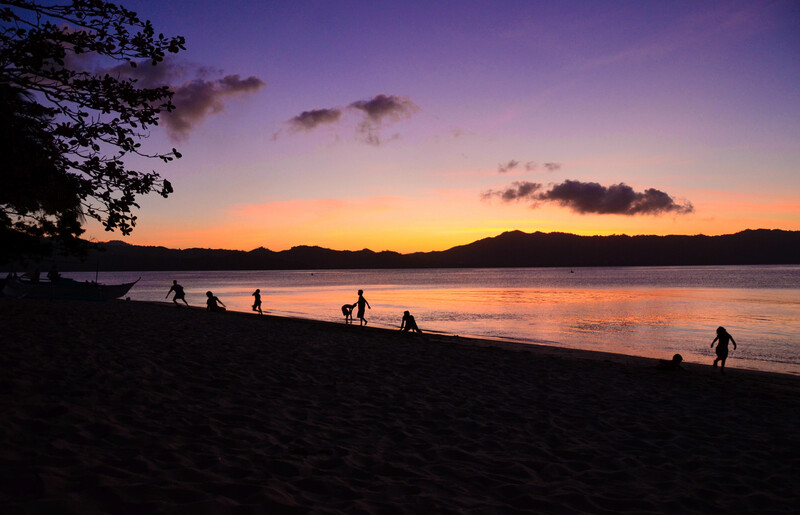 No two sunsets are ever the same in the Philippines, as I noticed during an island hopping adventure from Coron to EL Nido. Living in a city like Hong Kong, something as simple as the Sun’s movements become totally irrelevant to daily life and, as with most things, it isn’t until you find it again that you realize what you have been missing. It truly brings about a sense of jealousy aimed at the people who get to appreciate the transition every day. My fondest memories of Palawan were of sitting on the beach with a pineapple-rum filled coconut, watching the fisherman retire for the day as the dusky orange sky began to illuminate with the first dusting of stars. Looking around the immediate area, you find people sharing the scene, local youths playing football on the beach, couples lying in hammocks, cooling off from the days excursions. It’s a peaceful and relaxing vibe that makes you realize even more how vital traveling is to life.